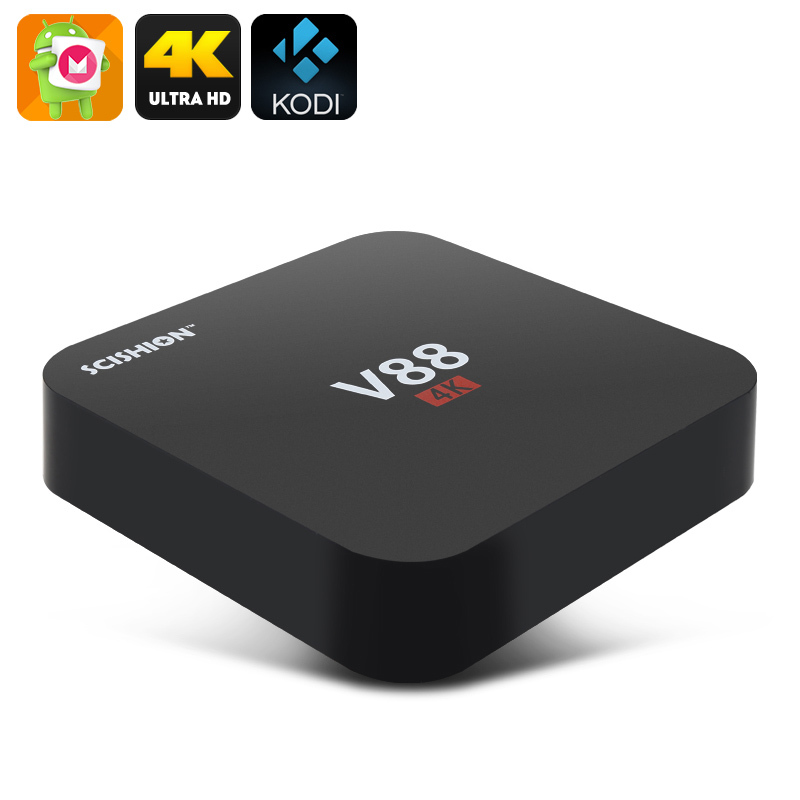 Successfully Added SCISHION V88 Android TV Box - RK3229 CPU, 4K, Android 6.0, KODI, WIFI, 3D Movie Support, 4 X USB, SD Card Slot to your Shopping Cart. With its Rockchip RK3229 CPU the V88 TV Box brings a solid performance and the Cortex-A7 processor teamed with a Mali-400MP CPU you get a richer viewing experience that supports 4K resolutions. The 3840 by 2160 pixel output of this TV box is equivalent to two 1080P screens so you're ready for the 4K revolution. With a 4K TV you can enjoy this amazing detail making you feel like you're in the middle of the action, especially as this TV Box supports 3D movies for immersive viewing. Kodi 16.1 media player comes preinstalled and will open the door to a wide range of repositories that offer thousands of channels for free! This lets you select the best of TV and movies from around the globe streaming them direct to the TV box over your home Wi-Fi or via an Ethernet line as the TV box supports both internet connections options. 4 USB ports on the V88 TV box let you hook up all your peripherals such as mouse, keyboard, gamepad or camera. An Android 6.0 operating system offers all the productivity and entertainment support you need with access to the Google Play store. 8GB of onboard storage along with SD card support ensure there's enough space for all your needs letting this smart TV box become your go to media centre serving up entertainment for all the family. The V88 TV Box comes with a 12 months warranty, brought to you by the leader in electronic devices as well as wholesale Android TV Boxes..
Everything was fine! i recieved in 3 weeks! the packning was good, thank you! Easy to use, comes with preloaded apps, real value for money, I highly recommend this product. I should have ordered a wireless keyboard with the TV box. Perfect condicions a fast shipping. All correct! Good product and good price.